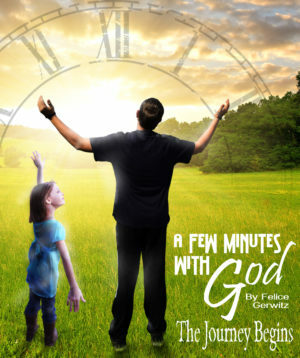 What is A Few Minutes With God? Podcast #1 -What is A Few Minutes With God? Do you spend a few minutes with God daily? In this podcast you’ll meet Felice Gerwitz, who hosts this weekly broadcast. 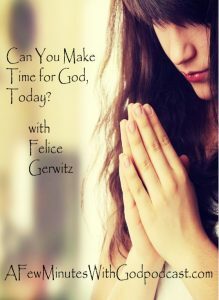 She discusses what she means by, “A Few Minutes with God.” To her, it is a time to reflect on the most important moments of your life and be she will share the challenge, to be open to listening to what the Lord has planned for you. Challenge: listening to the small still voice of our Lord. A deeper desire to know him better. Commit or Recommit your life to the Lord: Lord Jesus, I need You and I know I am a sinner. I thank You for dying on the cross for my sins. I open the door of my life and receive You as my Savior and Lord. Thank You for forgiving my sins and giving me eternal life. Take control of all of my life. Make me the kind of person You want me to be. It is JESUS that saves and brings us to the Father – this is my first step – but it is not my final step! He wants so much more of us! A desire to understand and discern God’s still small voice – how do you know it is really God who is speaking to you? How do you know you are not making it up? A desire to act upon the message – how are you going to implement what the Lord is urging you in prayer? How will you do HIS will – how will HIS will work in your life? We as Christian’s believe that Jesus is our Savior but the son’s focus was always to bring us to HIMSELF so that HE could bring us to the FATHER – our God – ELLOHEEM – Jehovah GoD.—“I AM WHO I AM”—only belongs to HIM. . Thanks so much, Gene – appreciate it! That’s what you do on a daily basis!